The 27s is the grandest story of rock & roll, firmly ingrained in popular music and culture yet the saga somehow slipped through the cracks of time; until today. If you're reading this you probably know that Jimi Hendrix, Janis Joplin, Jim Morrison, and Kurt Cobain's lives were cut short at age 27, but the same fate happened to thirty other musicians. Sure, they weren't all equally famous, but every one of them pushed rock in new directions, leaving lasting legacies that continue to inspire fans and musicians. No chapters, just one complete story that unfolds over 312 pages bursting with color and original illustrations, quotes from interviews, curious coincidences, riveting revelations, and a myth greater than them all. It's a story about modesty & excess, fame & loneliness, success & defeat, struggle & perseverance, and life & death. From hellfire hymnals to anarchic rock and roll, Apocalyptic Jukebox reveals our collective fixation on disaster, revelation, and impossible salvation. American popular music has always been preoccupied with the end of the world, be it the Second Coming or a natural or nuclear disaster. In Apocalypse Jukebox, Edward Whitelock and David Janssen uncover both the paranoia and hope that thread through the nation's history and surface in its music. From the books's opening scene--a terrifying 1883 meteor s hower in the American South--a sense of doom is palpable. And it is this deep foreboding that shadows every development in North American popular music. The authors examine a remarkable diversity of apocalyptic influences, focusing in particular on such performers as Bob Dylan, Leonard Cohen, John Coltrane, Devo, R.E.M., Sleater-Kinney, and Green Day. Not bad, huh? The authors will be here at good old Decatur CD at 7pm on Friday, May 22. They'll be reading from, signing and selling the books. Warren is also prepping a monster of a mix that will feature selections from both books. We'll have some beer as well. 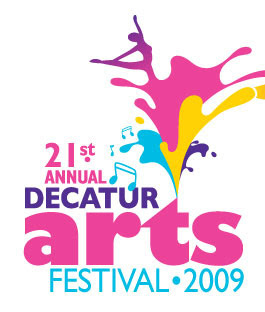 It's also Decatur Art Walk night, which kicks off the Decatur Arts Festival weekend. Should be a blast. These both look like very interesting reads! Yeah, they're both fun. Add the beer Warren got and music mixes we're making, and it's gonna be pretty amazing!